Successfully Added Hubsan X4 H107L Drone - 6-Axis Gyro, LED Lights, Brushless Motor, 2.4g Wireless Control, 80m Flight Distance to your Shopping Cart. The Hubsan X4 is a great beginners’ drone that lets you enter the world of RC drones at an affordable price. It is extremely compact and light-weight. This allows you to literally carry it along anywhere you go. With its own 2.4g wireless controller, this mini-drone is easy to control from beginning drone pilots. Your drone features an 80m control distance, thus allowing you to enjoy unlimited freedom while cruising through the skies. Thanks to its miniature size, this RC drone is great for indoor and outdoor flying alike. With its 6-axis gyro and brushless motor, this RC drone brings forth a great performance in all weather conditions. It also comes equipped with LED lights that allow you to easily track your drone while flying at night. The Hubsan X4 drone comes equipped with a small yet powerful battery that treats you to up to 7 minutes of continuous flying time. Thanks to its different flying modes, this RC drone is sure to meet your in-flight demands. It can be moved in any direction and even supports 360-degree flips. The latter lets you make loops in the sky and fly upside down. 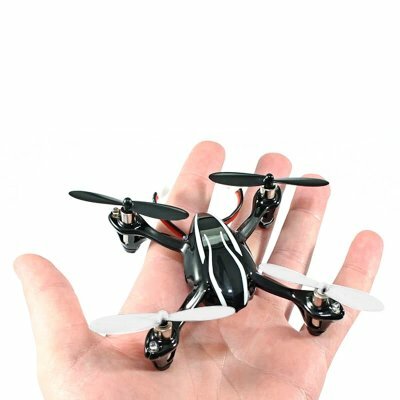 With its durable design, compact body, and wide-range of in-flight abilities, this RC drone will treat you to hours’ worth of fun to come. The Hubsan X4 H107L Drone comes with a 12 months warranty, brought to you by the leader in electronic devices as well as wholesale Quad-Copters..